Cross-a-Pix puzzles can be played interactively on the computer, offering many features and advantages compared to pencil and paper. This section explains everything about how to play Cross-a-Pix on the computer. If you are not yet familiar with the puzzle rules, please go to Cross-a-Pix rules. 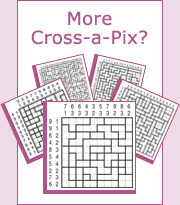 Cross-a-Pix Interactive is played by filling or blanking regions in a grid. First click fills a region, second click displays dots to indicate the region is blank and third click brings the region back to its original state. When all squares in a row or a column are completed, a gray triangle will appear and the respective clue (or two clues for DualClue Cross-a-Pix) will automatically check off. To finish the game, all regions must be either filled or blanked according to the rules. When the last region of the puzzle is filled or blanked correctly, a congratulations message together with a thumbnail of the puzzle will pop up. Cross-a-Pix Interactive offers horizontal and vertical rulers to help focus on the clues of the row or column being solved. The rulers also contain counters at their tips, showing the number of filled, blanked or empty squares, as well as the number of blocks in the case of DualClue Cross-a-Pix. Rulers may be hidden by selecting the option in the Preferences dialog box as explained below. Marking squares is a useful feature, especially in large puzzles, to highlight squares while counting and analyzing rows and columns. When in the Mark square mode, first click marks a square with a small circle and second click unmarks the square by removing the circle. Clear all marked squares at once. Check all filled and blanked regions for errors. Auto check completed lines: Check this box to automatically show errors when a row or column is completed. Show full rulers: Check this box to show full rulers. Open How to play Cross-a-Pix page you are reading now.